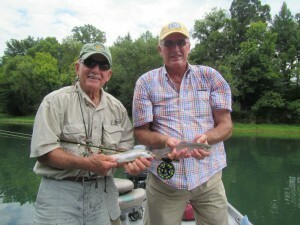 Many of you know our old fly fishing friend Paul Broddick. Over the years Paul and Bo have made fly fishing from the Bahamas to Alaska and so many points in between. This is the second time this month that Paul has brought his brother-in-law, Duane, from Houston, Texas, to the Little Red River for some Arkansas fly fishing. Duane has made a bunch of fly fishing trips in his own right so the guys had a good time comparing stories of all of their fly fishing travels. Anyway, as the day developed the guys decided they wanted to a photo of a double up catch by the brothers-in-law. They actually doubled up five times but they kept waiting for a couple of good picture fish. They kept working hard and we made multiple fly changes trying entice some bigger fish. It was one of those days where you could take a few fish on a #20 Black Zebra Midge, then a few fish on a #16 Krispy Kreme, then a few fish on #16 Trout Crack, then a few on #16 Born’s Hairy Legged Sowbug and so on. Paul finally said let’s make one more cast and call it a day. Both flys were not in the water ten seconds and BOOM,IMG_0012 a final double! As you can see, they were not very big Rainbows but it was a cool way to end the day.